Sandra and I returned from a trip into Zambia and Zimbabwe in mid August with myself visiting both nations, Sandra travelling to Zimbabwe. We wanted to write and encourage you with the excellent time we spent in both countries, seeing the grace and favour of God poured out. It has been quite a number of years since we were in these nations and so it was good to pick up on the covenant friendships and relationships we have there, developed over many years. The brothers all send their love and greetings to everyone in the UK, they were thrilled to receive us there once again. The purpose of my trip into Zambia was to gather with apostolic ministries from the across the southern belt of the African Continent, discuss our plans and intent for the extension of the kingdom in that region, and across the globe and to consider what we could do Together, looking to God to assist us as we seek to lay down truth for future generations to build with. During our time there we consolidated our relationships and intent to stand together for the Kingdom, we decided to call the relationship of families “Restorers Relational Movement” as it is our desire to become a movement of friends together, progressing kingdom advance and seeing our towns and cities restored. We discussed teaching and training programmes and the development of Covenant College in South Africa and planned an International conference to take place in Zimbabwe next August, as well as deciding to host further Round Tables in the African context. The International Conference which will be held in Zimbabwe next August will be open for all to attend and we would love to have a large contingent from the UK there with us, in 2017 we will be in Zambia for this International Conference. Please would you encourage as many folk as possible to consider making this trip, start a saving scheme now and lets bless our family in Africa with our presence there. The conference will take the form of a bible week and will therefore have accommodation available, which would be of a suitable standard. This would be an ideal time to introduce any young people with you to a wider view and understanding of the kingdom of God and the large, diverse family they belong to. If you have any questions on this please do get back to me. We will also host a Round Table in the African context next year. During the discussions we talked regarding the 'Apostolic Round Table', it was felt by the Holy Spirit that in 2016 we should be together in the African context. We agreed that we would connect the ‘Round Table' with the 'Africa Aflame' conference in Cape Town with Cedric and Denise. The 'Africa Aflame' conference is scheduled for 30th March though to 3 April 2016 pre-ceeding this conference we have set the dates for the 'Apostolic Round Table' as 28th, 29th, 30th March 2016, knowing this leads on from the Easter Weekend. Cedric wishes to extend his invitation to us all to be part of 'Africa Aflame' and to make a contribution to the conference along side him. The Venues for both times will be in the Cape Town area, hoping that our new college property will be purchased by then, for travel arrangement we advise you to travel into Cape Town. Let us pursue together the onward development of our family across the globe. We will send further details as they become available. Restores Relational Movement is an international family of apostolic families joined in heart and mission defined by its core values. Our DNA builds on the continuity provided by the collective wisdom of the past while embracing change of the present, listening to the Holy Spirit in each new season. We are committed to proclaiming Gods goal in RESTORING all of creation and humanity to Gods first though and ultimate intention, while proclaiming the KINGDOM of God, the responsibility and order of God in our world, believing that God is requiring a highly relational way of life that is found within the COVENANT of God. We see Gods love for all of humanity and creation and believe that salvation means the whole of creation is restored and healed. Men and Women, given to the process of Restoration in a Relationship forming movement - in essence FRIENDS CHANGING THEIR WORLD. Moving together reaching out to others to join the movement of Gods progress. Spiritual architects and builders, empowering missionaries and inspired thinkers, sacrificial leaders, wise mentors and teachers working together to ensure the people of God reflect Christ in his fullness. Restoring Christ to His church and restoring Christ to creation is our commission together. The Restores Relational Movement think, speak and live in the light of the completed work of Christ, working with the indwelling Holy Spirit transforming lives and creation. This RELATIONAL MOVEMENT is all about connections and relationship. We are a group of people moving together, being the incarnation of God, this is the church, across the UK, USA, Africa, India, South America and Europe, who are onwardly choosing to be together. A RESTORATION RELATIONAL MOVEMENT being there for one another. A recent blog by Cerys duffty from her time in Uganda. Advertisements, visitors and a library. What a busy and exciting month this has been! Where to begin? Thanks to Sophie Greener; an A’level student at Caludon Castle School we have been able to design and print leaflets and a school prospectus to advertise Wellspring International School. Sophie raised money by selling cakes during lunch times and break times. With this money we have been able to create excellent advertisements, which in turn will help us to develop and grow. As we come to end of the academic year these leaflets have come at just the right time to advertise for the next school year. Next week we will be delivering these leaflets to people in the nearby local areas. 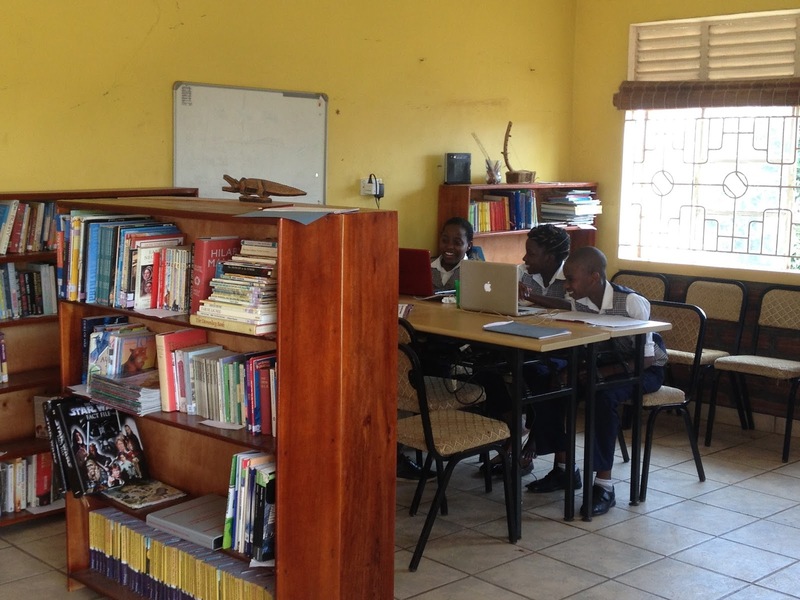 After hard work in organising, registering and sorting the amazing amount of books we received from Books to Africa and the Nettle Hilll team we are pleased to announce that the library is now set up and complete with over 2440 books. It has been amazing to see the students in both the primary and secondary schools absolutely enjoying reading the variety of books here. There are so many books ranging from academic text books for a range of subjects from English, Maths, Science, Psychology, Sociology, Geography, History, ICT, Business studies and many more subjects to Novels; including Thrillers, Action, Adventure, Romance and Comedies to Biographies, books around Food, Travel and Entertainment. 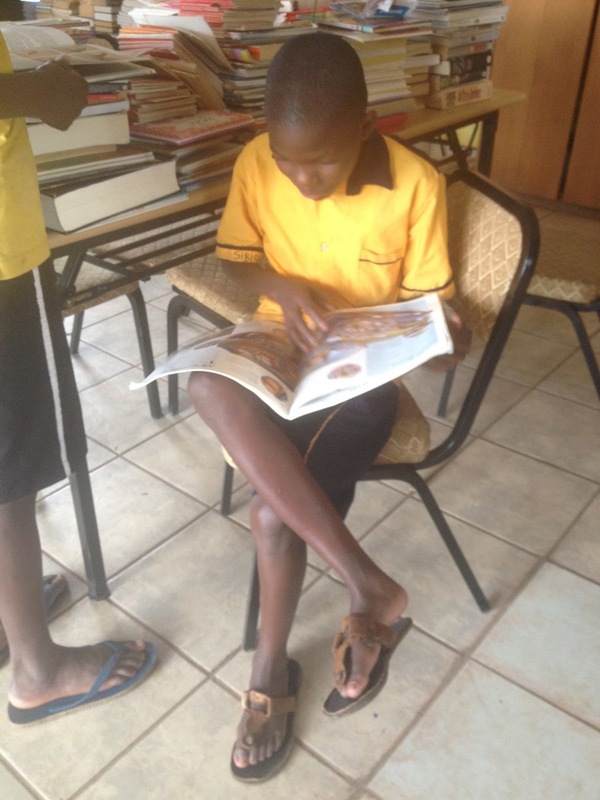 We also have around 600 books for the primary school and young readers, including many reading schemes. This resource is the only one in the area, it will be used to support the community work that is already taking place within Wellspring and beyond. The community work helps to teach those who have not had the privilege to go to school basic literacy skills. The library will not only be an excellent resource to support this work further but will also support the work that takes place in both the primary and secondary schools. Helping to develop a love and culture of reading. As the school year comes to an end we are looking forward to our last open day for the year on Sunday 5thJuly. This will be a day where we can really advertise the school and newly opened library. Over the last two weeks I have had the privilege of having some very special visitors coming to volunteer at Wellspring. Three ex students from Caludon Castle School; Charli Roberts, Arron Hope and Jyoti Chauhan, (all of whom I taught when they were 13 years old, and then the girls I taught A level Philosophy, up until they were 18 years old) came to offer their help and support. They were involved and stretched out of their comfort zones whilst taking part in many activities in both the primary and secondary schools. They taught PE lessons, Music, Dance and Drama lessons and also did some arts and crafts lessons with the primary school. A particular highlight was seeing them teach the students how to dance English Style to the famous ‘Saturday Night’ dance. I don't think Arron ever thought he would ever teach a dance lesson! They were also involved In teaching English lessons with the students from the secondary and helped to support these students facilitate and lead a whole school debate with the primary. This was an excellent tool to develop the secondary students’ leadership skills whilst they took on the role of facilitators in the primary! Chali, Jyoti and Arron also enjoyed helping and supporting the community work that takes place. They enjoyed travelling to other communities, seeing what life is like for people here, meeting and chatting to the locals and also helping to support the skills training taking place. It was an absolute honour and privilege to have some ex students come and visit; they have all grown up, matured and it was lovely to see their desire to want to add and make a difference into society and peoples lives. The academic year finishes here on Fri 3rd July, after this I am looking forward to visit friends in Tanzania. Wellspring also has a work in Dar Es Salaam, alongside visiting friends I am looking forward to seeing the work Wellspring are doing there. I will then be coming home for a month in August, I can’t wait to catch up with many of you very soon! Thank you again for your continued support, love and constant communication. Your support has helped to create and make a difference here!